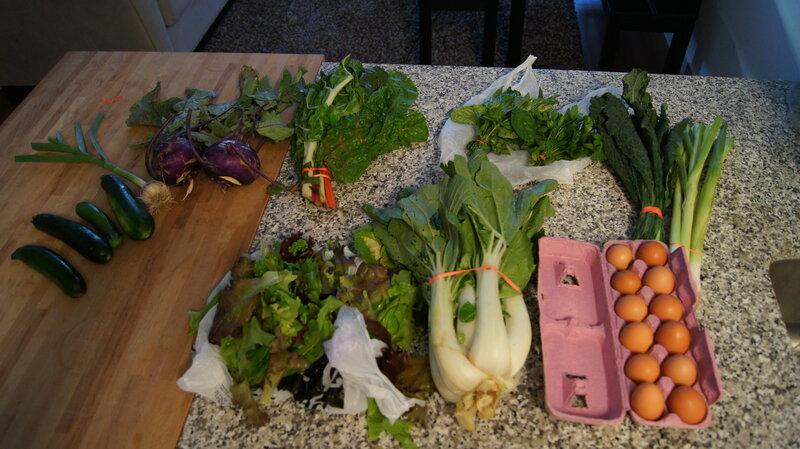 Here is this week’s CSA pick up. 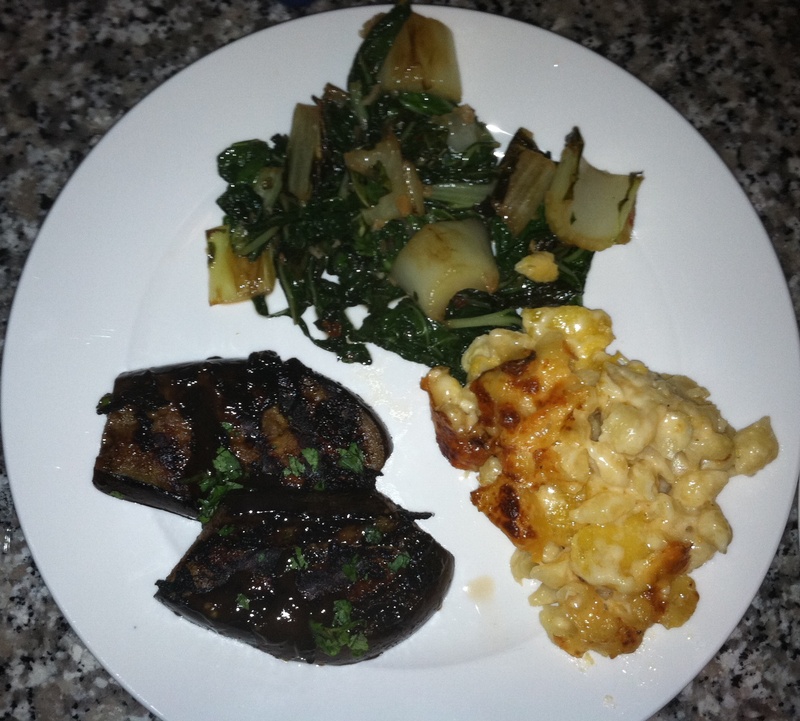 Last night for dinner I made Acorn Squash Macaroni and Cheese (click here for the recipe – it was SO good), Spicy Hoisin Glazed Eggplant (click here for the recipe – thanks Caitlin!!) and Spicy Bok Choy in Garlic Sauce (click here for the recipe). I used every single pot, pan, cutting board, measuring cup and wooden spoon in our apartment AND set off the fire alarm . . . but it was worth it. I missed my pick up last week due to the Outstanding in the Field event. It was great to get back on track with it. This is the pick up this week. The share was practically begging me to make last night Taco Tuesday, so that’s what I did. Used the peppers, onions, cilantro for tacos, guac and pico de gallo. You’ll see that there are no tomatoes in my picture. They looked kind of weird so I decided to leave them for someone else and buy grape tomatoes for our pico. I like them in pico better, anyway, makes it sweet. I think I’m going to make some sort of Asian Chicken Salad with the salad mix and red cabbage. Can’t wait to bite into that baby watermelon! Tonight, though, after yoga I’ll be enjoying an omlete by myself because Mike will be going to this movie with Danny. It opens tonight and he’s been DYING to see it. Question: What is Purple, Green and Red All Over? 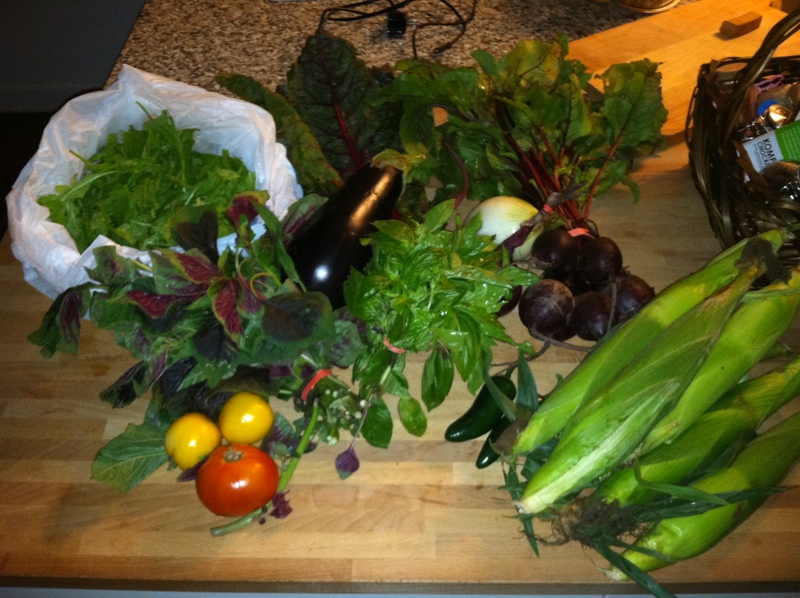 Answer: My CSA pick up this week. Purple seems to be the theme for this week. 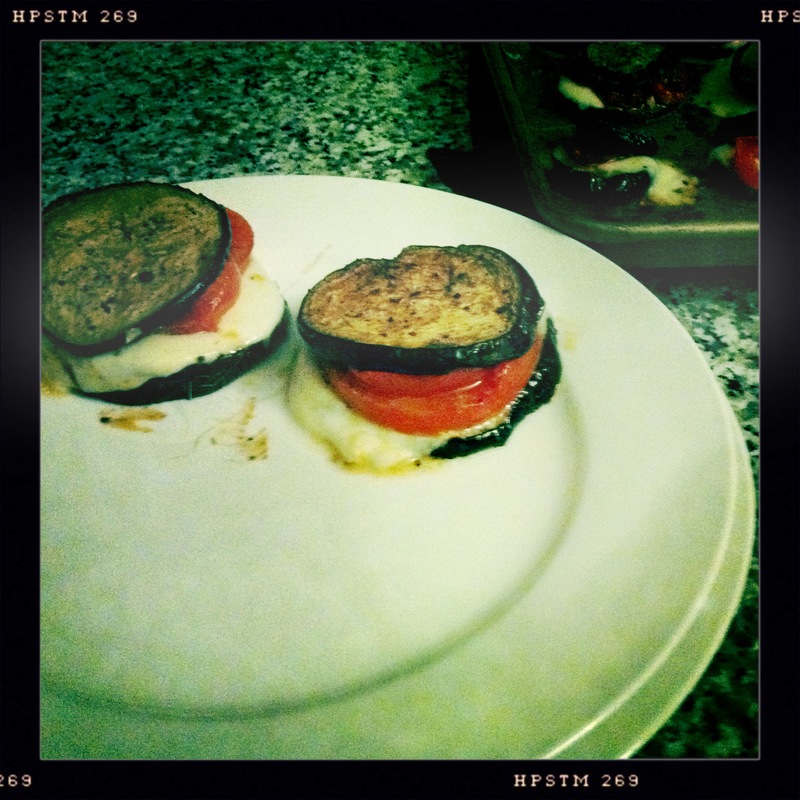 I already used the eggplant and large slicing tomatoes (added in a few Jersey tomatoes from Vicki’s mom’s garden – OMG they were SOOO yummy) and made eggplant stacks for dinner last night. 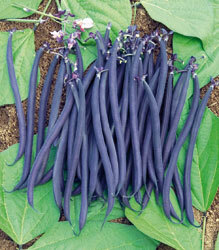 The odd item of the week is the Velour Stringless Beans. Mike is in Atlanta until tonight and then we’re leaving for Jamestown after work tomorrow so it looks like I’ll be bringing everything with me up to Jamestown. I’m sure we’ll come up with a nice feast for Lauren’s b-day. As far as French Laundry goes . . . I don’t want to make the meals . . . I want Thomas Keller to make them for me. 🙂 Oh well, it will remain on my bucket list! I like the quilt, its cute. Can you stitch blocks maybe? 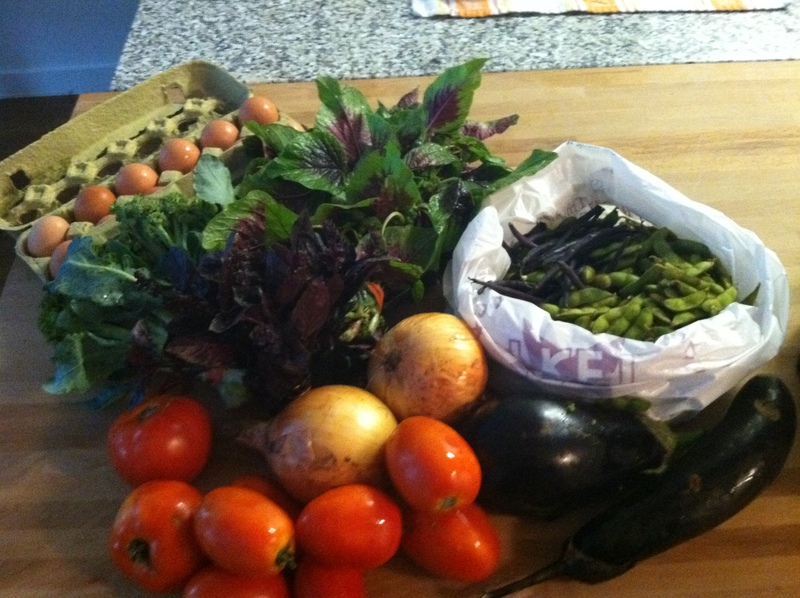 I had my fourth CSA pick up yesterday. No eggs this time . . . the hens are starting to die from heat. 😦 So sad! Mike and I are making pizza with chicken sausage, tomatoes, basil, arugula and onion (and cheese of course!) tonight. Mike is heading to Jamestown on Thurs night so I’ll most likely just bring everything else to Jamestown so we can use the grill. I’m going to saute with garlic the swiss chard, kale and beet greens for dinner tonight (along with chicken and cous cous). 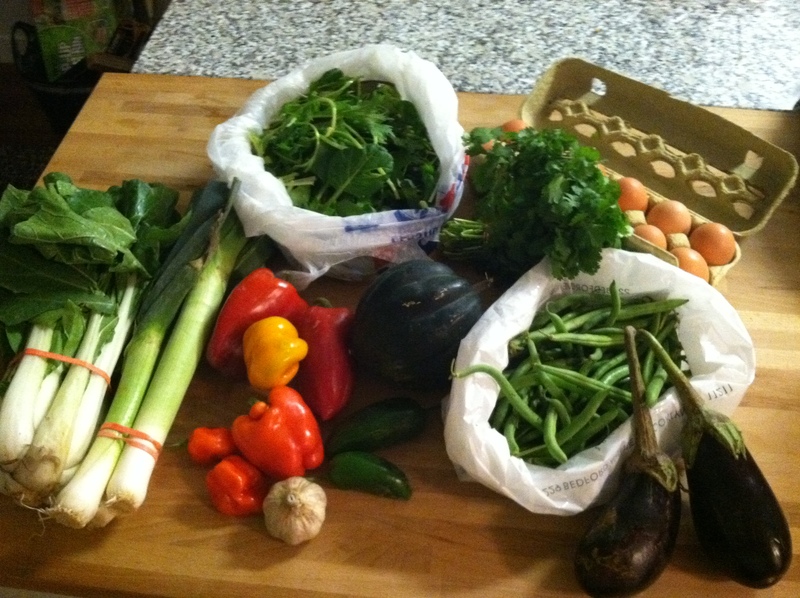 I may attempt to cook the yellow beans too and have two veggies. I’m going to probably make cucumber and onion salad and blance the beets and add them to the salad mix with some goat cheese and candied walnuts for later this week. I’m getting good at this! 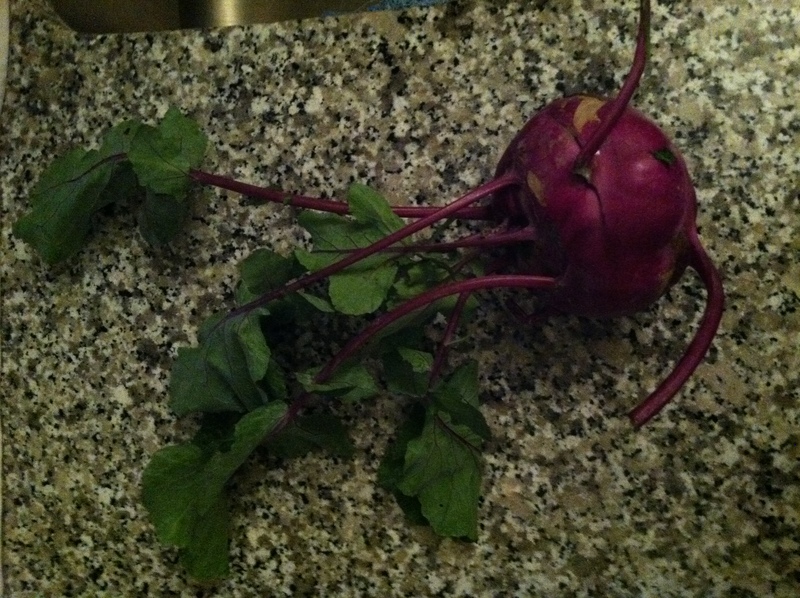 What is purple kohlrabi? It is a type of cabbage that looks like a root vegetable but actually grows above ground. Kohlrabi has a crisp, juicy texture and the earthy sweetness of a combination of broccoli and cabbage. Kohlrabi is delicious paired with fresh herbs like chives, cilantro or parsley, radishes, carrots and apples, as well as with seasonings like horseradish, sesame, ginger, and mustard. Slice it into batons and snack on it with a creamy dip or dressing in the afternoon or before serving dinner. Thinly sliced, it can also be added to a salad. A popular way to prepare kohlrabi is as a slaw. Kohlrabi is also tasty sautéed or roasted (cut them into thin slices or bite-size wedges first) or added to a braise or stew. You can also boil the bulbs until tender and mash them. Using the zucchini and some of the basil I made Shrimp and Zucchini with Bowties for dinner last night (and leftover for lunch today). As far as the other items . . . 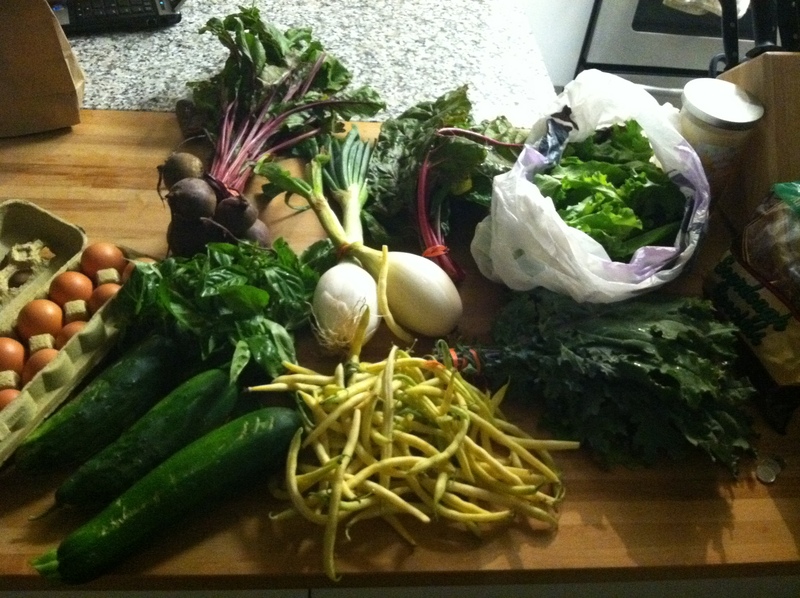 I may just saute the swiss chard and kale and roast the kohlrabi and make that for dinner with chicken. One night can be Salmon with Carmelized Leeks . . . and another night Bok Choy Salad topped with grilled chicken. Speaking of dinner . . . look at this article that was in the NYT’s today. THERE are picnics, and then there are picnics. Three weeks ago, in the golden light of an early-summer evening, thousands of Parisians dressed entirely in white converged on two of the city’s most picturesque locations — 4,400 of them in the plaza at the cathedral of Notre Dame; 6,200 in a courtyard of the Louvre — for a feast that was neither advertised nor publicly heralded. They had brought along not only their own epicurean repasts but also their own tables, chairs, glasses, silver and napery. At midnight, after dining and dancing, they packed up their dishes, stowed their empty Champagne bottles in trash bags brought for that purpose, stooped to pick up their cigarette butts from the cobbles and departed. The landmarks were left immaculate, with no traces of the revelry of the previous three hours. This annual event, called the Dîner en Blanc — the “dinner in white” — is like a gustatory Brigadoon, equal parts mystery, anachronism and caprice. Now attended by thousands at some of the best-known Parisian spaces, it began humbly in 1988. That year, François Pasquier, now 67, returned to Paris after a few years abroad and held a dinner party to reconnect with friends. So many wanted to come that he asked them to convene at the Bois de Boulogne and to dress in white, so they could find each other. But while in certain circles in Paris, everybody knows about the Dîner, many Parisians have never heard of it. And despite the precision that goes into its planning, it retains an air of surprise. For the first time, New York will have its own Dîner en Blanc, on Aug. 25, rain or shine. A thousand people — half invited, the others drawn from an online waiting list (newyork.dinerenblanc.info) — will participate in this refined flash-mob feast, at an as-yet undisclosed location in Manhattan. The New York event is being spearheaded by Mr. Pasquier’s son, Aymeric, who lives in Montreal, where he inaugurated the Canadian version of the Dîner en Blanc in 2009. But can brawny Manhattan, with skyscrapers from top to bottom, innumerable regulations and a dearth of public spaces on a Parisian scale, possibly approximate the romance of the French pique-nique? The New York organizers, Daniel Laporte and Alexandra Simoes, are hopeful. In New York, as in Montreal, the Dîner en Blanc is being conducted openly, facilitated by Facebook and Twitter and other online aids, and coordinated with municipal authorities. But in Paris, despite the tacit approval of government officials, the Dîner is private — a massive demonstration of the power of word of mouth, and the strength of social connections. The guest list is made up entirely of friends, and friends of friends. And despite the dinner’s vast and visible attendance, it has remained discreetly under the radar. Paris is still a class-stratified society — “It’s horizontal, whereas Montreal is vertical,” Aymeric Pasquier explained — so unwritten rules of privilege have allowed secrecy to surround the event. Nobody is sure who decides, year in, year out, which people are invited to create tables for the evening. François Pasquier calls the party-list formation a “pyramide amicale,” a friendly pyramid; trusted friends invite their own trusted friends. The event’s exclusivity was evident just before the Dîner en Blanc in Paris on June 16. As I hurried with my dinner companions along a bridge to Notre Dame last month, passersby stopped us. One tourist asked, “Do they do this every night?” If only. At 8 o’clock, clusters of diners emerged from the Metro or chartered buses to gather at rallying points, where they had been instructed to meet their “heads of table,” the organizers who had invited them. The site is revealed at the last moment, both to avoid gate-crashing and to preserve instantaneousness. The guests, decked out in white suits, dresses, skirts, feather boas and even wings, carried heavy picnic gear and delicacies like pâté de foie gras, poached salmon and fine cheeses — each table brings its own meal. At about 9, with the sky still light, the site was announced. Guests hurried across bridges and side streets to reach their destination. By 9:30, all the tables had been deployed in orderly rows, according to diagrams in the possession of the heads of table, with men all along one side, women along the other. The guests quickly covered their tables with white cloths; laid out the crystal for Champagne, wine and water; the plates for hors d’oeuvres, main course and dessert; and began tucking in. As night fell on Notre Dame, a clergyman appeared and blessed the throng, and church bells rang out overhead; at the Louvre, opera singers serenaded the diners. At 11 in both places, diners stood on chairs and waved sparklers — signaling the end of dinner and the beginning of the dancing (to D.J.’ed music at Notre Dame, and to a brass band at the Louvre). An hour later, the frolickers switched off the merriment and packed up their tables to depart, like Cinderella, on the stroke of midnight. Needless to say, New York presents its own challenges. As in France, the organizers have created a fleet of “heads of table” who will collect picnickers at various meeting points around the city and shepherd them to the location. But some differences will apply. For one thing, it’s likely that Champagne will not be permitted, if the Dîner is held in a public location. For another, the proceedings are expected to end at 11. “Even if we can’t have Champagne, it will be nice still,” Ms. Simoes said. As in Paris, guests in New York will have a strong incentive to uphold the code of conduct. If they misbehave — for example, by bringing uninvited guests, getting too rowdy or not showing up or helping to clean — they will receive a punishment worse than any police fine: being barred from future dinners. “Any guest who doesn’t respect the rules of behavior will be put on a blacklist and never invited back again,” Aymeric Pasquier said. Initially, Mr. Laporte and Ms. Simoes worried that New Yorkers would find these rules too demanding. 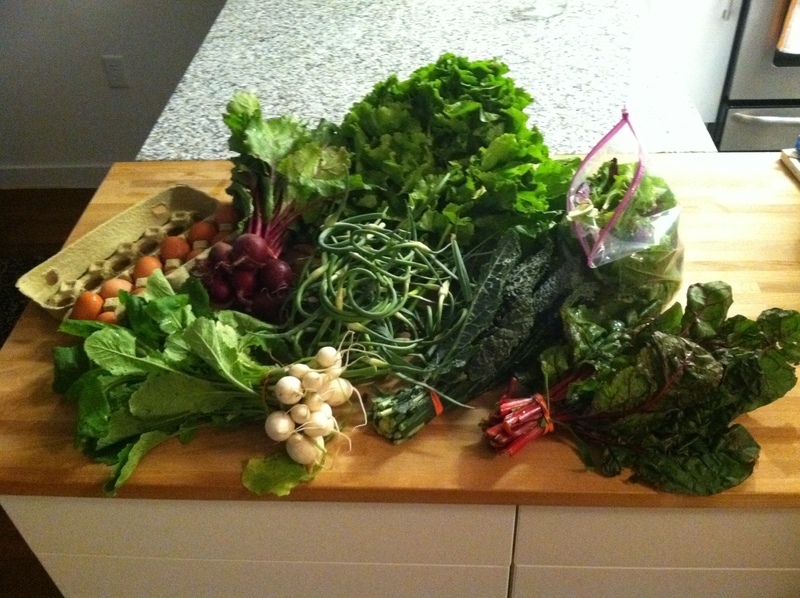 Yesterday was my first CSA pick up . . . I know, turnips, your favorite! 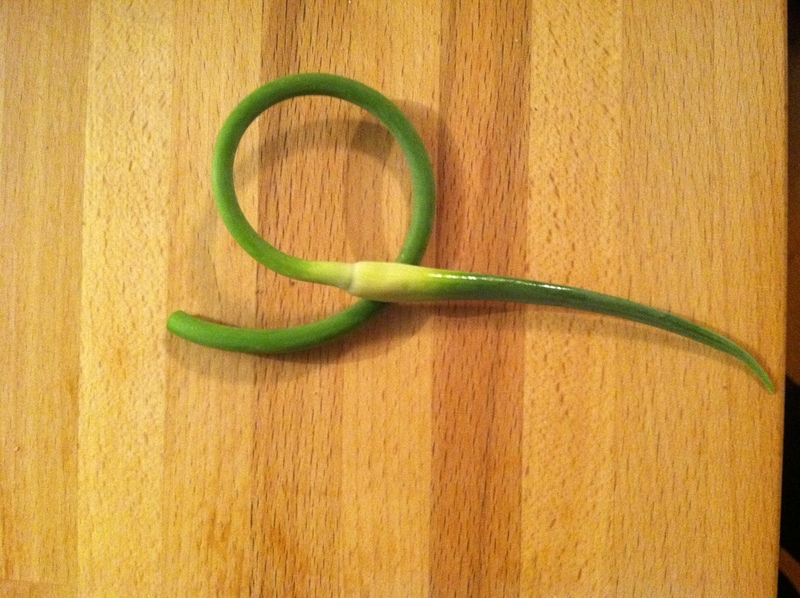 Have you ever heard of garlic scapes? They’re a flowering shoot that gets snapped off the garlic plant shortly after they appear so that the plant’s energy stays focused on developing a large, healthy bulb underground. Use them chopped or minced in whatever you’d normally use garlic. 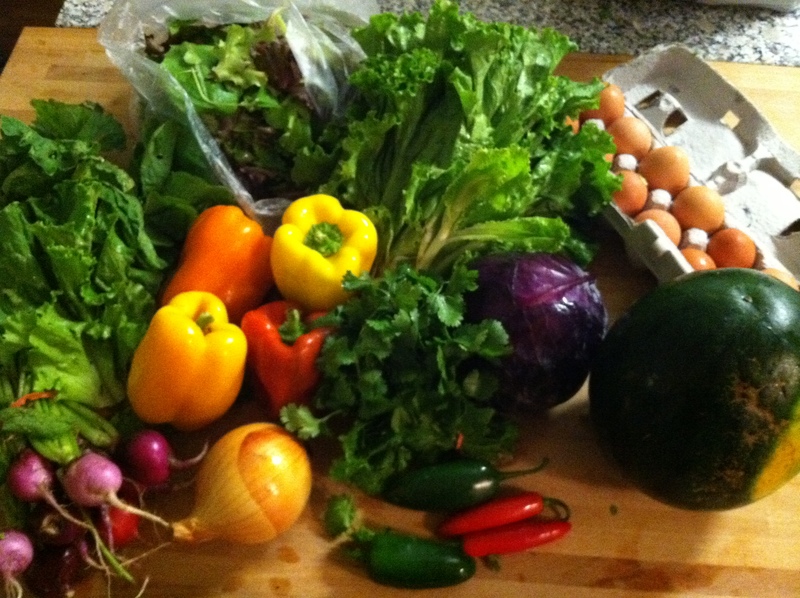 The CSA weekly newsletter always comes with a recipe (usually for the most unusual item in the pick up). The recipe in this newsletter is for Garlic Scape Pesto, which I will probably make. We have a birthday party in Long Island this weekend (at Craig and Holly’s – VT wedding) that I think I may bring it to as a gift. Holly loves that kind of stuff. Optional: To bring out the flavor of the walnuts, gently toast them over medium-low heat in a skillet until fragrant. Remove from the skillet immediately. Let cool before processing. Place scapes and walnuts in the bowl of a food processor and pulse until well combined and somewhat smooth. Slowly drizzle in oil and process until blended. With a rubber spatula, scoop pesto out of bowl and into a mixing bowl. Add parmigiano to taste; add salt and pepper to taste. Store in an air-tight container in the refrigerator for one week. Or freeze in a thin layer in a sealed freezer bag. Break off a portion of the frozen pesto to use as needed—to flavor pastas or soups or spread on a sandwich. As for the other items . . . I made kale chips last night (YUM). Tonight for dinner I’ll be solo (Mike is in Toronto) so I’m going to use the salad mix, hard boil an egg, cut up a beets and a leftover avocado from mexican monday, throw on a few nuts, olive oil and vinegar and make myself a salad for dinner and lunch tomorrow.